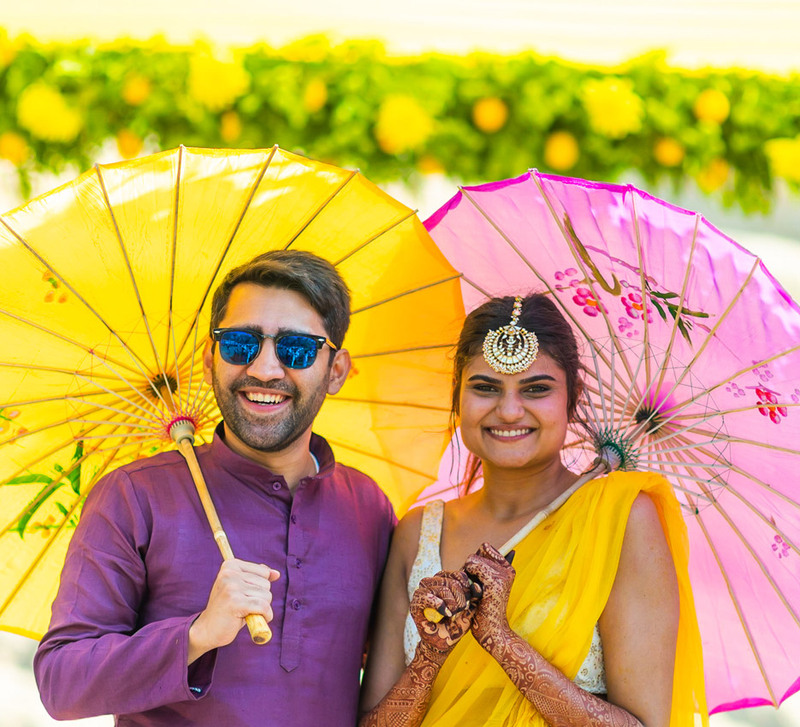 From a poolside carnival mehendi to a Frieda Kahlo inspired sangeet, Richa and Rohan’s wedding was a unique affair. 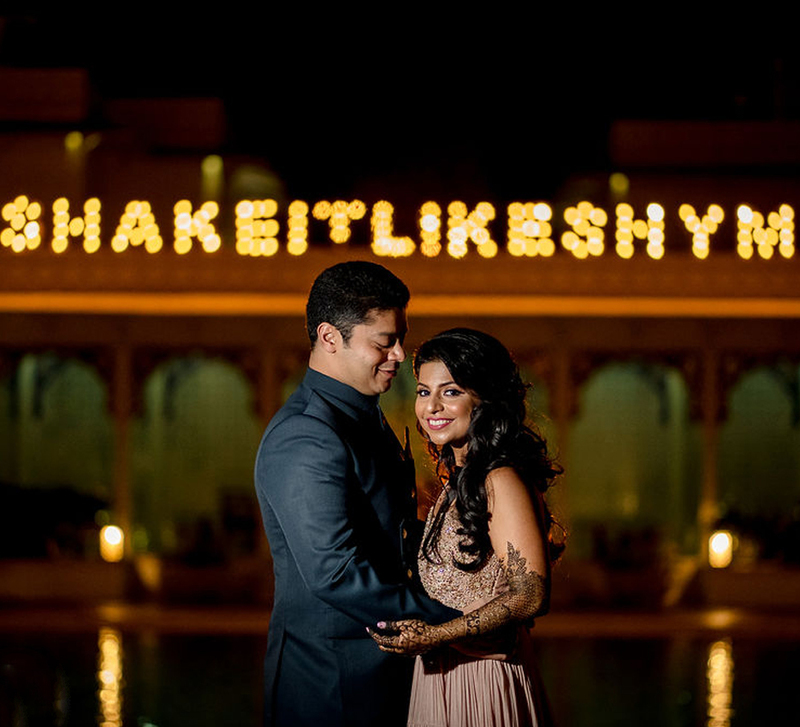 The enchanting environs at the JW Marriott Jaipur Resort & Spa resounded with merrymaking and joy at Richa and Rohan’s wedding. With all their loved ones in attendance, the duo tied the knot with revelry and romance. 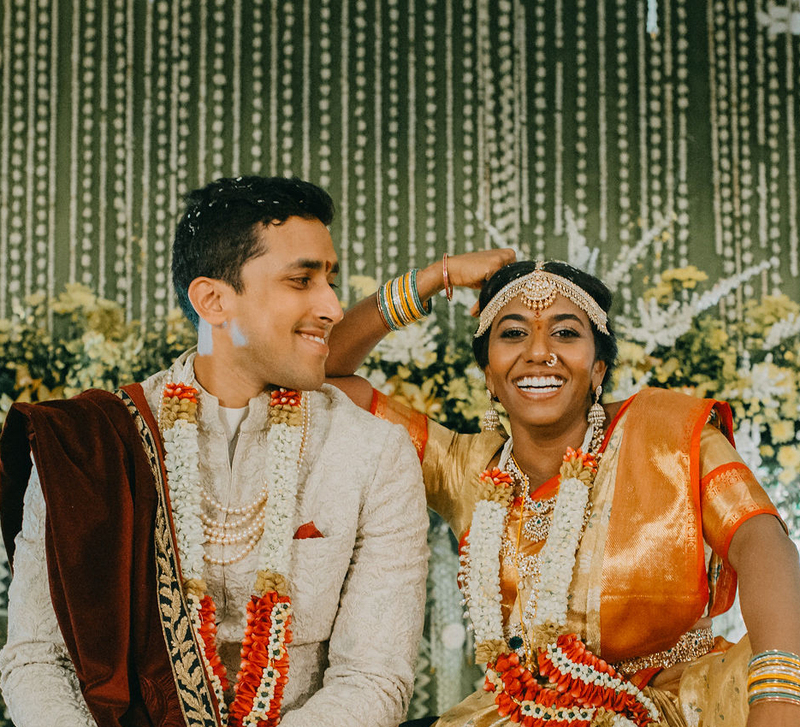 Here are highlights from their lavish celebrations captured by WeddingSutra Favorite Sam & Ekta. Richa and Rohan were introduced by their respective families and were then left on their own to get to know one another. Long conversations on the phone and multiple texts were followed by dates. And the better they got to know one another, the closer they got. They acknowledged that each was “The One” for the other. Before they knew it, they were in love. The welcome dinner was hosted on the rooftop of the property, kick-starting the wedding festivities. This elegant evening came alive with great live music and an impromptu performance by Rohan’s family which was the highlight of the evening. Hosted by the pool, the couple made an epic entry to the wild beats of the dhol at their mehndi the next afternoon. Guests spent the party having a crazy time with the giant Jenga towers and getting competitive at the ring toss booth. But you didn’t see the real competition until the emcee declared an impromptu dance off between Richa and Rohan’s friends and family. Cheers and whoops filled the air as the couples’ parents set the stage on fire with their amazing dance moves, instantly turning the function into an unforgettable one. After this, it was time for the choreographed routines which then led to the dance floor being opened to all. The spirit of Frieda Kahlo imbibed the sangeet. Bold colors, unique artsy props and an artist vibe suffused the evening. Acrobatic dancers performed as the couple entered. And then it was time for Richa and Rohan’s squads to take over the dance floor and entertain the crowd with mind blowing performances. Then Sachin and Jigar came onstage followed by DJ Khushi who set the mood for the evening with a playlist crackling with 90s Bollywood hits. The next morning, the haldi and sainth ceremonies were observed. Punjabi folks songs were played and while the ladies were involved in the ritual, the youngsters amped up the fun factor by smearing turmeric on the couple. Rohan’s baraat was the highlight of this day as he made a grand entrance to the venue. Harshdeep Kaur’s soulful voice serenaded the guests as Richa walked into the spotlight, looking absolutely beautiful. Soon after the varmala, the venue lit up with fireworks followed by another performance by Harshdeep who sang for Richa and Rohan as they had their first dance.